Lab powder booths are designed for small batch, manual applications it features a compact plenum design offering a larger work area. Extremely quiet and environmentally friendly, this booth is a perfect solution for operations with limited space available. 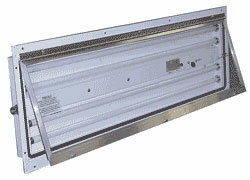 Dwyer Purge Control Assures the safe operation of the coatings enclosure by maintaining the airflow at design levels. During operation, powder accumulates on the cartridge filters. As the cartridge filters load, airflow decreases and negative pressure rises within the air handler. The adjustable timer activates a system of air purging valves that clear the cartridge filters of accumulated powder to ensure maximum life. Controls Includes NEMA 12 UL and ETL listed control panel mounted to the side of the collector module, factory wired and tested. Automatic or manual cartridge filter pulse down mode. Includes a mounted magnehelic gauge for filter monitoring. Variable frequency drive (VFD) to control fan speed. Pressure switches to monitor final filter pressure and warn/shutdown if pressure exceeds set point. Base Assembly The powder coated Rollaway base assembly cabinet and floor support is fabricated with 3” channel steel and formed 10-gauge mild steel (welded construction). Our factory trained installation crew can get your new Lab Powder Booth installed correctly and quickly.